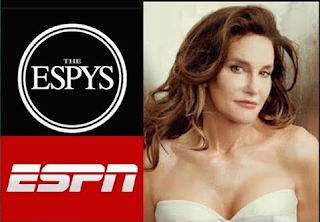 Decathlon winner Caitlyn Jenner to receive the Arthur Ashe Courage Award at this years ESPY Awards. Caitlyn Jenner will make her first major public appearance at one of the biggest events in all of sports -- The ESPYS -- where she's set to receive one of the highest honors the network hands out. Jenner -- who was an Olympic champion back when she was a he -- says ESPN has chosen her as the winner of the Arthur Ashe Courage Award. According to ESPN, the award is given to those who truly personify the spirit of tennis great Arthur Ashe -- someone who shows "strength in the face of adversity, courage in the face of peril and the willingness to stand up for their beliefs no matter what the cost." Previous winners include Muhammad Ali, Stuart Scott, Jim Valvano, Robin Roberts, Nelson Mandela and Michael Sam. The ESPYS are set to go down in L.A. on July 15th -- and Caitlyn, along with her 10 children and stepchildren, are expected to be on stage when she gets the award. Pure foolishness, these yt's are not to be taken seriously and are the grand marshal's of the fuckery parade. There is nothing courageous about becoming a woman! This is nothing more than the gay mafia projecting their agenda onto the entire country! I will not watch this awards show! Not only is this absolutely disgusting, it is also satanic. God doesn't make mistakes, people do. Bruce Jenner made a big mistake. What's next, is the gay mafia going to give a lifetime achievement award to Dennis Hastert?